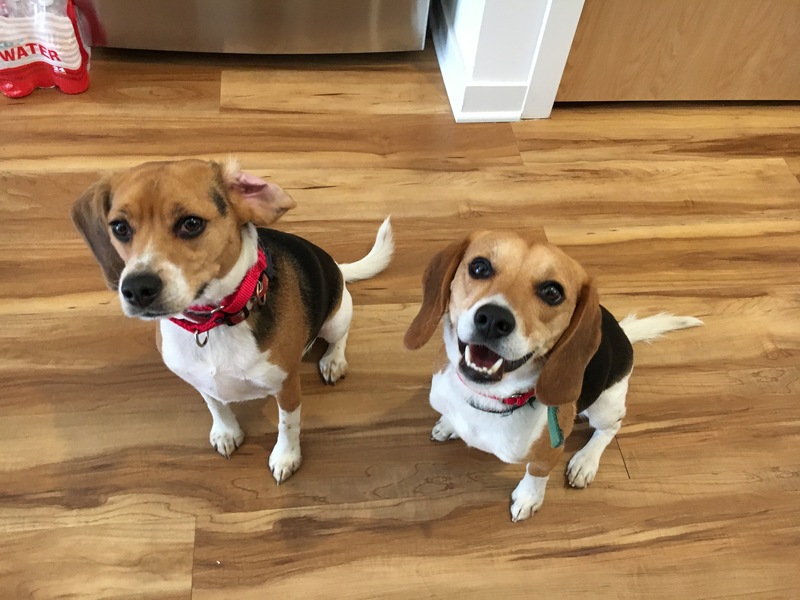 Regis and Bennett are a pair of Beagles who moved to Omaha a few months ago. The guardians set up a dog behavior training session with us to work with Bennett to get him to stop jumping up, stop barking, stop charging the door and help him with some anxiety and submissive urination. As soon as I got into the door I was greeted by a lot of jumping up, but nowhere near as much barking as I expected. When I sat down with the dog’s guardians, I learned that they didn’t have any rules in this home. This was different than their previous home in New York. As a dog behaviorist, I have frequently seen a lack of structure result in dogs who saw themselves as peers with their human counterparts. Problem is, if a dog sees you as a peer instead of a leader, then listening to you is optional. I spent several minutes highlighting some rules and boundaries that the guardians can put into place to help the dogs start to see them as leaders and identify as being in the follower position. I also went over new non verbal ways to communicate with the dogs that closely resemble the way the dogs communicate with one another. While a lack of structure was a major issue, the dog’s excited behavior was a heavy influence too. Not only did the dogs get excited easily; the humans unintentionally reinforced things by petting the dogs when they were in an unbalanced state. I recommended the humans start to practice my Petting with a purpose method to train the dogs to ask for attention instead of demanding it. Adding a tiny bit of structure to repeating tasks like this can have a cumulative effect on dog behavior. I also showed the humans how to break activities down into small steps so that they can train the dogs to behave the way they want. This kind of dog training is frequently skipped by humans and is the cause of many unwanted dog behavior problems. A good example of this was the dogs getting excited when the humans got ready to take them out on a walk, an example of Classical Conditioning. I pulled out my camera and asked the guardians to show me how they leashed up the dogs so I could see just how excited they got throughout the process. While this was far from the most excited dog behavior I have ever seen, I knew these Beagles could do so much better. I walked the guardians through the process several times, offering dog behavior tips as we practiced. By going through the leashing process in a practice setting, we reduced the pressure and instead of focusing on the end result, we worked with the dogs on each individual step until they were behaving how the guardians wanted them to. You can see their progress by watching the short video below. Many people fail to take the time to train a dog to behave how they want it to for various activities. By breaking things down into small steps, it didn’t take long for Regis and Bennett to learn exactly what their humans expected from them. We wrapped up the session with a quick walk around the block so I could show the humans how to get the dogs to listen better and stay in a heel position next to their humans. Because we waited for the dogs to be in a calm state before we headed out on the walk, their behavior was much better. By the end of the session, the dogs were respecting human’s personal space, sitting to ask for attention, following some of the new rules on their own and looking to the humans for guidance and leadership.